Blue Power Group Limited (BPOW) for the nine months ended January 31, 2018, booked a 10% increase in revenue to total $1.15 billion compared to $1.05 billion for the same period in 2017. Revenue for the Lumber Depot increased 13% to $808.72 million, while revenue for the soap division increased 2.2% to $340.78 million. Revenue for the quarter totaled $388.30 million, 5% above last year’s corresponding quarter of $371.11 million. Cost of sales for the period increased 15%, closing at $897.76 million up from $783.87 million the year prior. As such, gross profit amounted to $251.73 million, a decline of 5% when compared to $264.90 million recorded last year. Gross profit for the third quarter fell 7% to close at $30.38 million (2016: $37.29 million). Profit before tax totaled $90.14 million compared to $119.47 million last year. The company booked tax charges for the period of $10.87 million (2017: $14.36 million). Net Profit for the period totaled $79.27 million, a 25% decrease compared to $105.11 million the prior financial year. Net profit for the quarter amounted to $23.27 million compared to $35.60 million booked for the third quarter of 2017. Earnings per share (EPS) for the period totaled $1.40 (2017: $1.86). EPS for the third quarter amounted to $0.41 (Q3 2017: $0.63). The twelve-month trailing EPS is $1.70. The number of shares used in our calculations amounted to 56,499,000 units. 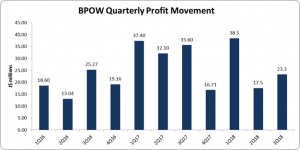 BPOW’s stock price closed the trading period on February 27, 2017, at $34.87. As at January 31, 2018, total assets amounted to $817.49 million, up $89.81 million from the balance of $727.67 million as at January 31, 2017. The increase in total assets was as a result of the increase in cash and cash equivalents from $261.24 million, to $315.51 million. Shareholders’ Equity of $739.77 million was reported (2017: $654.52 million) which resulted in a book value per share of $13.09 (2017: $11.59).